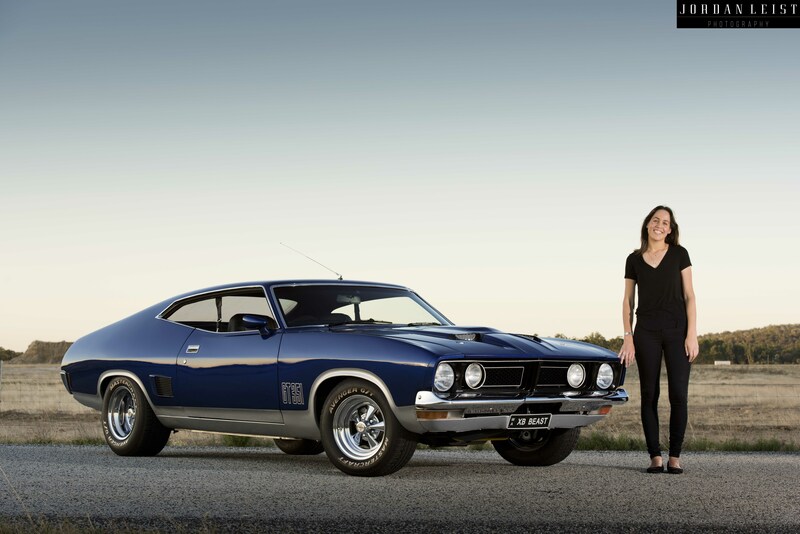 Kate de Boer can thank her parents’ good taste in Aussie classics for her obsession with old-school cars, in particular, the XB Ford Falcon Coupe. “It’s definitely a family thing! My parents are both into classic cars, and my four siblings have been the same since day dot too. My first car was an EK sedan that I bought when I was 16, and my older sister had an FB sedan — they were a pigeon pair. One of my younger sisters has an HT Premier, and the other one has an HZ Premier. My brother has owned some really neat cars over the years too — my favourite out of his rides was an HG station wagon with a 350 Chev. Dad still owns the HQ panel van he bought when he was 18. However, he chopped the roof off it to make it into a wellbody ute back in the 80s. He regrets doing that every day he looks at it. He has another HQ wellbody ute with a 308 which is gorgeous. When I was in high school, Mum used to drive a WB Statesman De Ville with a 308 as well, I think she’s still sad that it was sold,” said Kate. With her formative years being centred around car culture, it was inevitable that her passion would continue. It was back in early 2015 that the urge to add that other Ford to the stable was just too much, so Kate started scouring the usual places. Something was located in Perth, but it wasn’t that flash. That is when Kate stumbled across this coupe, and as luck would have it, the car was owned by another woman. “When I called up I was pleasantly surprised to hear a lady’s voice on the end. It turned out that she had owned the car for around 14 years. Sadly she was placed in a situation where she was forced to sell the car. She was happy that I was interested in the XB, so I arranged to fly over to Sydney with my parents to take a look,” says Kate. The car is all that Kate had dreamed of – she did make a few little changes to the car though. “I went on the lookout for some other rims and came across an old-school classic – the 15-inch Cragars. I fitted them to slightly smaller tyres, 245s on the front and 275s on the rear. The other tyres were just way too big. My father and I argued about taking the lowering blocks out from the rear too. I wanted them in, and he said to take them out. I gave in, only to find he was right and it looked way better with its big coupe bum in the air. I also changed the exhaust system, it was just too quiet, and the V8 deserved to be heard,” laughed Kate. That V8 is a 351 Cleveland that runs AFD heads, a Crane Hydraulic cam and a Demon carby on an Edelbrock manifold. A C4 box sends the power back to a 9-inch rear end. The mocked-up GT looks the goods on the outside thanks to the Mauritius Blue paint scheme with silver accents. The interior is a mix of original and custom touches. There is a decent audio system in the car that takes up some space in the neat trunk area, but Kate still prefers to listen to the sounds of the Clevo.